Japan, 1964 Cor – 100 min. 2.35:1. In the Sengoku Period (1), a struggle for power divides feudal Japan. Civil war goes on for more than a century with grave consequences, especially for the poor; the people abandon their lands and it gets more and more difficult to obtain any food. Two women, mother and daughter-in-law (Otawa and Yoshimura), live in a shack in the middle of a high grass field by a river. Their way of life consists of killing wounded samurai passing by in order to trade their armour and weapons for food. One day Hachi (Sato), a neighbour that had gone to war with the younger woman's husband, returns home placing the family economy at risk. Shindo Kaneto is the author of an extensive filmography beginning in the fifties and coming a long way to this decade. His most famous titles — at least in the West — remain those from four decades ago. There we may find Kuroneko (1968) and this Onibaba, formerly available in video (released in the UK by Tartan for instance). Included in its Masters of Cinema series, British distributor Eureka! released, in July and August 2005, three films by Shindo: The Naked Island (1960), Onibaba and Kuroneko. The collection structure, the gathering of essential supplements, the care put into the materials used and even a good taste in the cover designs trying to, for as much as we can see, remain loyal to the original art, constitute strong reasons to capture film lovers attention. 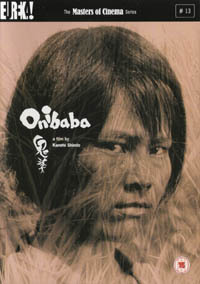 Onibaba is inspired by a Buddhist tale enclosing a very well defined morality. Although keeping its essential elements, focused into the narrative's climax, Shindo does not place his film in religious morality — his concerns are very earthly ones. Mother and daughter-in-law attack soldiers in order to trade their loot for food. Hachi's return will jeopardize their partnership. The film's premise points to one of the themes: survival under extreme conditions. When we first meet our main characters we may feel appalled for, even before we have seen their faces, we already know they are ruthless killers. But as the narrative unfolds, at the light of the historical background, the label (“killers”) is diluted. We set aside any judgement that the film does not intend to make. When Sato Kei's character arrives, sexual desire emerges as the main concept underlying throughout the film. The high grass (“suzuki”) fills the framework, waving endlessly from one way to the other, as if gathering a broad symbolism: war, duality, but also carnal impulses. The young woman runs through the field trying to satisfy her physical desires regardless of the atmospheric conditions and, towards the end of the film, of other threats. Such as Shindo, never embedding a moral pattern into the act of killing (its just a way of life), there are no feelings whatsoever between her and Hachi (it is just a way for both of them to get satisfaction). The daughter-in-law (Yoshimura Jitsuko) follows her instincts and runs towards Haichi (Sato Kei) through the suzuki fields. Shindo Kaneto defined himself as a socialist and the concept of class strugle is here, even though we follow mainly people at the bottom of the social pyramid (as much as such an expression makes sense in a ruined and torn apart society). The theme becomes more evident in those moments where the mother-in-law is speaking to the samurai hiding his face behind a mask, but it fills the whole work: the limit situation into which the peasants are placed has its origins in the conflict between the powerful ones. The historical period is also described by a rebellion of servants against their masters (seizing lands for instance) — an issue not directly approached but that Shindo most certainly took into consideration. Being a work suggesting a political, sociological, historical and even psychological analysis, Onibaba is not restricted in its formal component. The outstanding scope composition and the black and white photography, punctuated here and there by the lighting enhancing the bodies' pulse and anxieties, with the music and a dynamic sound design dominated by drums exacerbating primitive feelings, make the viewing a refined sensorial experience of great cinema. An harsh film, shot in a minimalist set — a river, high grass, shacks, a cavern —, in a cruel and violent world where the satisfaction of primitive instincts does not leave room for love, still includes an optimistic approach to the Human race's ability for survival. (1) Sengoku-jidai or The Warring States Period, from the middle of the fifteenth century to the beginning of the seventeenth century. See Wikipedia for further information. Eureka's DVD (RU R2), Masters of Cinema series, should be the best choice currently available. The video transfer is reputed to be better than that of Criterion (USA) and it includes more substantial extras. Our highlight goes to the audio commentary by Shindo Kaneto and actors Sato Kei and Yoshimuro Jitsuko (subtitled in English), recorded in 2000 for the Japanese release. They spend most of the time making general comments on the production and the people involved, just occasionally referring to the action on screen, which we may find understandable if we realize we are before a 36-year-old film (at one point, Yoshimura says “we are the only ones still alive!”). The DVD still includes a kind of making of — Super 8 footage (with no sound) shot by Sato at the film set —, a photo gallery and the original trailer.